The Need for Speed games on handhelds in the past tended to be scaled down efforts to the point where they were completely different games. In the case of the PlayStation Portable, it was due to the hardware limitations, which meant that the open world gameplay of 2004’s Need for Speed: Underground 2 was left out of the handheld version of Need for Speed: Underground Rivals. With the impressive hardware of the PlayStation Vita, EA finally had the chance to bring a direct port to the handheld instead of taking the usual route of developing a new game. 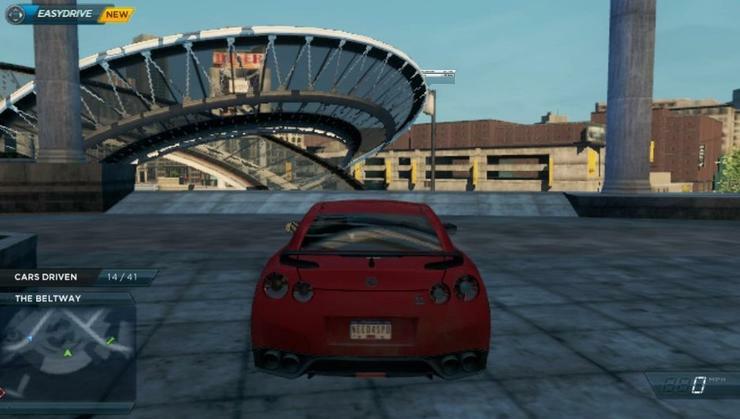 Once the initial thrill of driving in the open world of Need for Speed: Most Wanted fades away, the technical shortcomings with the game become apparent. For one, the game world and vehicles are missing a lot of detail compared to the console version. Not only are there fewer graphical effects, but the textures, lighting and shadows are also lacking. The game environment is also sparse and there is visibly less traffic on the roads. The game seems to be running at a lower resolution than the Vita’s screen, as there is a significant amount of aliasing during gameplay. The good news is that the same open world racing in the console version of Need for Speed: Most Wanted can be found in the Vita edition. If anyone has had the chance to drive the cars on the tracks of the console version, they will find themselves right at home with the handheld version. Controls are tight and responsive, which means that the vehicle can weave through traffic and obstacles with relative ease. Since this is the first time EA is doing a direct port of a Need for Speed game to a handheld, it will be up to the player to decide whether it is worth playing the game on the Vita as well as on consoles, or whether just to have one edition of the game. - Open world gameplay that brings a console quality experience to the Vita. - EA always outdoes itself by including contemporary rock and electronic music in its games, and Need for Speed: Most Wanted is no exception. - The Vita’s analogue sticks are put to good use during racing for a responsive experience. - Scaled down video and audio sour the racing fun. - A lot of graphical effects and details, such textures lighting and shadows, are either missing or significantly scaled down, resulting in the game looking rather dull. - The highly compressed audio results in a tinny sound, especially with headphones. - While the open world gameplay is a great addition to the handheld version, the reduced on-road traffic and overall technical issues means that the game experience is lacking overall. Need for Speed: Most Wanted makes one step forward by adopting the open world gameplay of its console counterpart, but also takes a step back with several technical issues.